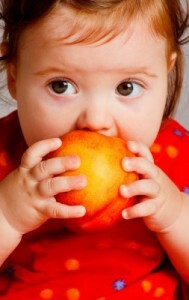 What toddlers are fed during the first three years of life could affect their IQ later on, a new study may have found. The study, which looked at children’s diet and IQ scores, may have found a slight connection between the two. Researchers from the University of Bristol looked at nearly 4,000 children born between 1991 and 1992. They found that children who ate more junk food had lower IQ scores than those who ate a well balanced diet with fruits and vegetables. The children and their diets were tracked between the ages 3 and 8.5 to see what types of foods they ate the most. At the end of the study, the children where given an IQ test to see how their diet affected their intelligence. Children who are mostly foods high in fat and sugar had scores that were slightly lower than the children who are more fruits and vegetables. For each unit of junk food the children ate, their IQs dropped by 1.67 points. Children who ate healthier diets gained 1.2 points in IQ. Though the difference was slight it may shown that what we eat during the first few years does have an impact on us for years to come. Researchers believe this is because the brain grows the most rapidly during the first three years of life than during any other time. This makes it the most vulnerable to changes based on our environment and how we eat.